University of Engineering & Technology is without a doubt one of the most prestigious engineering university of Pakistan. Hence getting an admission to UET is every engineering student’s dream. However, there is the entry test you have to pass with flying colours before you can start studying in UET. 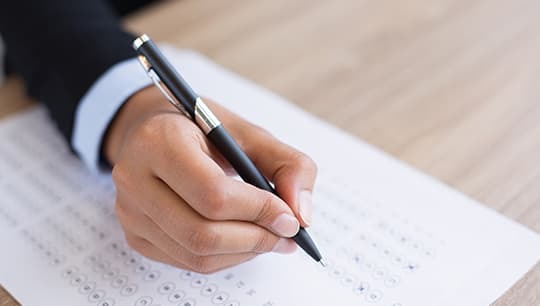 UET entry test preparation is a tough task as it normally involves going to academies, studying a lots of books, going through past papers, attending lectures, and in many cases moving to another city just for entry test’s preparation. All of the above also require a lot of money which many, for which parents work hard. But it doesn’t have to be that hard anymore, TopGrade.pk offers a complete solution so anyone with internet access can prepare for UET’s entrance exams. TopGrade.pk offers video lectures, fast revision notes, question bank of MCQs, practice tests, past papers and all other modern tools necessary for a full entry test preparation. Choosing TopGrade.pk your admission test preparation not only saves you a lot of money but also a lot of time and energy that can be put to better use. So be wise and adopt to the future now instead of relying on the same old studying techniques like academies etc. UET entry test’s preparation has the most importance above all other engineering universities admission test. The reason being this test is accepted by almost all the public sector engineering colleges and universities, hence it is also known as ECAT (Engineering College Admission Test). UET entry test is conducted once a year for pre engineering students. The test is conducted by by University of Engineering and Technology Lahore. In total there are about 3000 seats in Engineering colleges of Punjab, Pakistan. Each year some 45000 students attempt this test. Entry test is a pre-requisite for applying to UET Lahore or its affiliated colleges. Other public sector institutions like UET Taxila, BZU Multan, Islamia University Bahawalpur and some private institutions also require Combined Entry Test conducted by UET Lahore as a pre-requisite. He/She should have obtained at least 60% marks in F.SC/ ICS/ DAE/ B.Sc./ B .Tech(Pass) Examination excluding Sports and Hafiz-e-Quran marks. Candidate should have at least 60% adjusted admission marks (e.g. after including Hafz-e-quran and sports based marks) determined as per clause 2 of the merit determination criteria. Candidate should be a resident of the area from where he seeks admission. Candidate should meet standards of physique and eye sight laid down in the medical certificate. The entry test application shall be filled online through the web link http://admission.uet.edu.pk. Applicants should make sure that the entered details are correct and then take a print out of online submitted application for submission at the test center to obtain the admittance card. This printed application along with following attachments shall be submitted to one of the above centers where applicant wants to appear in the test. Intermediate text books of Physics, Chemistry and Mathematics. The test will consist 100 multiple-choice questions (MCQs). Each MCQ is followed by four options . Candidate is supposed to pick single best answer for each question. Each question carries 4 marks. Total marks are 400. Each question carries 04 marks. Total marks, therefore, are 400. There will be Negative Marking in the test. For each correct answer, 04 marks will be awarded whereas for each incorrect answer, one (01) mark will be deducted from the total score. No negative ,marking will be done on not attempting a question. UET entry test marks are valid for one year. The candidates must reach their respective centers well before the genesis of the test on respective date. For any query/complaint regarding the online registration, contact the university. Mobile phones and calculators are strictly prohibited. Following mentioned will be the centers of UET entry test AKA ECAT. To start preparing for the UET entry test by TopGrade.pk, sign uo using the above form and request a free demo. TopGrade.pk’s comprehensive course (PFUNG) will prepare you for not only UET’s entry test but also you will be able to score top marks in other admissions tests like PIEAS, FAST, NUST and GIKI.